Blocks comprise two movements? Dangerous hokum! "Traditional blocks comprise two movements." Of course, I'm referring to two separate movements off the same arm (eg. to one side, then back to the other; or up to the ear, then down low). Obviously I don't subscribe to this view. In fact, I think it is a misconception. And, as far as martial arts misconceptions go, I think it is one of the worst. In fact, I see it as blatant nonsense. Doesn't everyone has a valid viewpoint? Now I can see why some people might be scratching their heads here: why can't we just "agree to disagree" - everyone has a perspective and why should one person's be more "valid" than another? Well my feelings are strong on this issue precisley because the "blocks comprise two movements" misconception is profoundly wrong: in physics, objective design analysis and, I suggest, actual (historical and modern) use in civilian defence contexts. Despite this, the misconception is well-established today. It is so well-established that it goes almost unchallenged as a purported "modern, pragmatic and scientific analysis". This is only compounded when the misconception seems both "logical" and "self-evident" (just as we once thought the Sun flew around the Earth and that heavy things fall faster). It takes a lot to shift such fundamental, unchalleged misconceptions, so I know I have my work cut out for me. "But," I can hear people asking, "why is Dan so "het up" about this issue? What's the big deal?" The big deal is that this issue is fundamental to civilian defence: so fundamental that misconceiving it has the potential to fundamentally obfuscate (indeed, derail) centuries of sound, tested and proven methodology. Specifically, the notion that "traditional blocks comprise two movements" often leads to the common refrain that "blocks don't work" (at least, as "blocks"). This, in turn, leads to dismissal of traditional civilian defence arts, or at least anything involving "blocks", as "ineffective". If it doesn't lead there, it still results in a more subtle "revision" of traditional forms whereby blocks are interpreted as anything but blocks! The latter has spawned quite an industry of "new bunkai specialists" who tour the globe holding seminars and selling books and DVDs to disenchanted traditional martial artists who long to salvage something from the many years dedicated to their disciplines. Now it is true that many of these are adding real value to the pool of martial knowledge by exploring things like tuide (grappling) and other more sophisticated applications - and doing so without detracting from the use of blocks as blocks. In my experience, such instructors are very unlikely to suffer the misconception that "a block comprises two moves (not one) and accordingly can't possibly work". But equally there are many who do fall prey to such this misconception, and accordingly are apt to spout the mantra "a block is a lock is a strike is a throw - but never an actual block". It is interesting that some of these martial artists actually use blocks anyway in their bunkai - but without any sophistication or real knowledge of how this (vital) element works. Instead of acquiring a deeper knowledge and skill in the science and art of proper deflection, they hurry past it to get to the more "interesting" attack component. Accordingly their "blocks" amount to little more than basic palm slaps. Defence is, it seems, not that important. Others actually insist that "hard blocks are really important to our style" (when I think it is plain that hard blocks are, invariably, little more than "soft deflections done inefficiently"). Your bunkai are so yesterday! In this context it is unsurprising that such a mindset ultimately leads to the conclusion that blocks can't possibly be used in the way some (now unfashionable) 60s, 70s and 80s teachers (with "shallow", "basic" knowledge) used to imply. No - the real (hidden) meaning - one known only to those with a deeper understanding - is something else: something that has been "rediscovered"; something that requires the most obvious meaning to be ignored while some other, often very far-fetched (indeed, tortuous) construction is preferred. Well, what if this is all a big pile of hokum? What if, while sequences comprising blocks can and should be revisited for other more complex applications, it turns out that they are also highly effective as... well... "blocks"? What if blocks offer the key to civilian defence (as opposed to sport or military fighting) - especially where you are faced with an element of surprise in close quarters with little time, opportunity or legal/ethical/moral justification to launch a pre-emptive strike and where you are forced to rely on a withdrawing flinch reflex? The latter can only be true if the most fundamental objection to the humble block is resolved: namely that blocks are actually time-efficient. And they can only be time-efficient if they comprise just one move to match a given attack, and not two. Well I'm here to tell you that this is true. And next time I'm going to show you exactly why. A lot of the misunderstanding from blocks seems to come from learning to fight using the "faux boxing model" that you have mentioned in the past. When you shift the focus into the melee range and *KEEP IT THERE* (without flinching, backing off, circling, etc) then all of those weird movements you find in traditional martial arts--like blocking--start to work. Funny that, isn't it? And odd that so few people understand that. Great article, Dan. 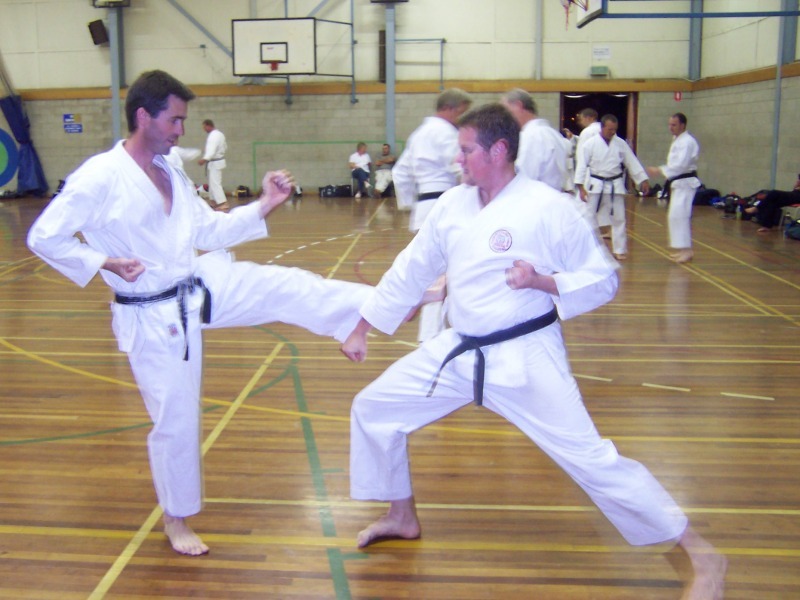 Do you know much about karate history? I only ask because I'd be interested in learning how the odd things that modern karateka do came about. Marc Macyoung did a good job writing about how Western boxing changed through the ages after coming a sport.(http://www.nononsenseselfdefense.com/evolution.html. But I'd love to know the history behind karate's "devolution." Hi Dan, fantastic blog! I used to study Karate and Judo for a long time, although it's been a while since I last have put on my dogi, reading through your posts here has inspired me to get some classes going again! I don't suppose you would be interested in sharing this over at Glipho? We're a new social blogging site with an active community of creative bloggers, many of whom write about sports, fitness and martial arts themselves- I know they would find your work here very interesting to read through! If you get a spare moment, perhaps you could take a quick look over at http://glipho.com and see what you think. You can even simply import any old posts from this blog into Glipho, without affecting anything at all. It's quite easy! Thanks for your time, and the brilliant blog. I look forward to reading more from you! I definitely fall into the "in-betweener" category that thinks that blocks can be locks, strikes, etc. but they can ALSO be blocks. We do teach them, initially, in the two-step method to make sure students practice the full range of motion (especially since some non-blocking applications require it) but for blocking purposes we make them softer over time until they are one movement. I've been posting in my blog on a recent "mass stabbing" incident at a Texas university. In this kind of situation, all you would need is awareness to see the attack coming, and the reflex to throw some kind of high block to deflect a stab or slash coming at the head/neck. We practice these kinds of blocks ALL THE TIME in kata and kihon. This is a clear, real-world application that could have saved serious harm (and may, in some cases, have done so - not all the details are out). Great article as always. Great to finally have someone come out and tell it like it is. @WC_Writer - I do know a little about karate history. The problem is that there has been so much historical revisionism in recent decades. Combined with the relative lack of records and photographs (due, to a large extent, to the Battle of Okinawa) it is hard to discuss this issue today without facing a barrage of "That ain't so - we can trace our practice back to Bodhidharma!". I did write some historical articles a couple of years back where I started gently undoing some of the popular "karate myths" (eg. 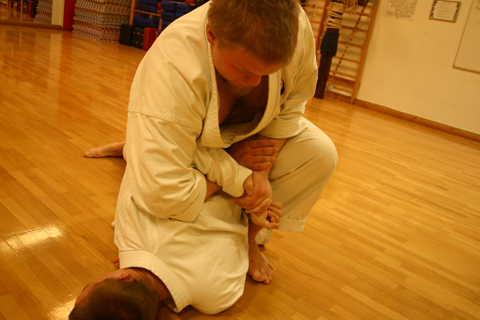 the origin of goju kata) but it is hard work. Sometimes I feel all I can do is encourage those who remember karate in the 50s, 60s and 70s to speak up; because a lot of knowledge about both history and even technique (how many people remember the humble yoko keage geri?) is fading away. It is being replaced with a complex mess of new dogmatic paradigms that were, at best, marginal concepts in old Okinawa. I'm thinking of such popular modern theories like hip-shaking, "there are no blocks", and the general apophenic tendency to see BJJ techniques in kata like heian shodan (which is to me like seeing the Virgin Mary in a piece of toast). @Teo - thanks, I will investigate glypho.com. @Noah - see my following article (posted 11 April). I do have a question: Are you really teaching blocks initially as 2 movements - or are you simply using a "reset" motion between blocks that allows you a full range of movement in basic practice? I suspect it is the latter. @William (I presume you go by William?) - yes thanks! I've been reading your blog with great interest; always tightly written, insightful and persuasive (as was your comment here). People forget that civilian defence has specific needs and goals. That's why we call it "civilian defence" and not "civilian offence"! 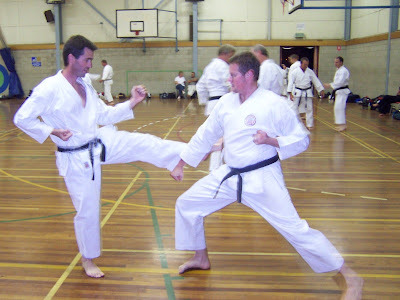 @Anonymous - many karateka today seem obsessed with blocks being used as strikes. However I can't see why. It's as if we don't have enough strikes already. As I said to William, we practise arts of civilian defence, not civilian offence! So why not use strikes as "blocks"? Indeed, I use them this way all the time - sometimes as "simultaneous" block/strike combinations, sometimes as mere "blocks". After all, we don't want to get hit. That's our first priority. 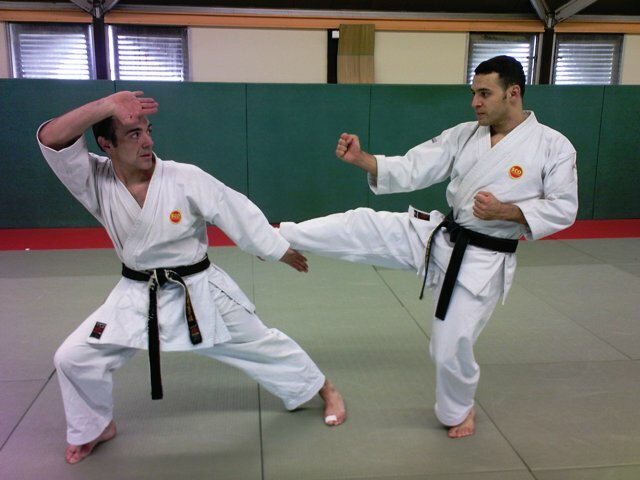 The most obvious example of "strike as a block" for most karateka is the gyaku shuto (reverse chop) which functions very well as a forearm rotation deflection. I actually think this is its primary function. Is it useful as a strike? In my view, not so much: I'd rather just punch or even hammer fist. Of course, strikes are also most adaptable to grappling maneuvers (again - blocks, not so much). Thanks again all - and remember to read my follow up! This article is just a rant - the follow up has the substantive argument!